Investors have gotten wildly bullish of late, as the bull market that started in early 2009 keeps driving stocks to new highs. But the pigs are about to get slaughtered, says Bob Prechter, president of Elliott Wave International and editor of the Elliott Wave Theorist. (See video below). Prechter still thinks the new bull market is just a cyclical “retracement” of some of the bear market losses that we’ve had since the market crashed in 2008. Prechter expected this retracement to drive stocks 50% above the market lows, but stocks have since soared 30% higher than than he expected. So when the day of reckoning comes, Prechter thinks, it will be even more startling. And Prechter still thinks that stocks will eventually crash to new bear-market lows (read: below 6,800 on the DOW). What makes Prechter think this day of reckoning may come sooner rather than later? Sentiment indicators and other technical analysis. Investor bullishness has now gotten so extreme, Prechter says, that it has exceeded the levels in 2008 before the market crashed. Investors could still get even more bullish, of course, but eventually they’ll pay for this optimism. 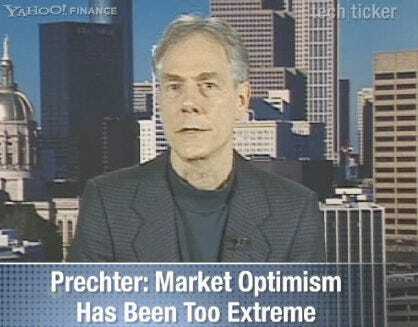 And Prechter’s not just bearish on stocks: He thinks oil, silver, and other commodities are absurdly overvalued, too. The only thing he’s bullish on is the dollar. And lest he be dismissed as a perma-bear, Bob Prechter is quick to add that he hopes there will come a day when he can come on the show and tell everyone that stocks are finally so crushed and hated that it’s a historic opportunity to buy them.